The ceremony for Normandy veterans to receive the Legion d’Honneur in May was a very special occasion. On 6th of June 1944, Europe was waking to the news that the Normandy landings had commenced and that Allied troops were beginning the liberation of Europe. In the evenings leading up to this, the French Air Force squadrons based at Elvington were flying missions over France in preparation for this day. We can only imagine what it must have been like to be flying bombing missions over your own country, then seeing the huge armada crossing the sea as they returned home in the dawn light. This large picture gallery from the recent medal ceremony shows all of the veterans from that day and is perhaps a suitable way to remember those challenging times and the proud men who survived to enjoy peace, plus of course the many, many men who didn’t. Thank you to Vale Radio for the podcast that allows you to hear more of the ceremony. Thank you to photographer David Harrison for documenting this special day. Legion d’Honneur medals presented to 21 Normandy Veterans at Yorkshire Air Museum on Sunday 22nd May, 2016. Pictured is Ken Smith of Wheldrake, York, who recieved the medal from Colonel Bruno Cunat, French Liasion Officer to the Ministry of Defence. Picture David Harrison/ Yorkshire Air Museum. Legion d’Honneur medals presented to 21 Normandy Veterans at Yorkshire Air Museum on Sunday 22nd May, 2016. Pictured is Willie Riley of Brighouse, who recieved the medal from Colonel Bruno Cunat, French Liasion Officer to the Ministry of Defence. Picture David Harrison/ Yorkshire Air Museum. Legion d’Honneur medals presented to 21 Normandy Veterans at Yorkshire Air Museum on Sunday 22nd May, 2016. Pictured is Bernard John Richardson of Mirfield Leeds, who recieved the medal from Colonel Bruno Cunat, French Liasion Officer to the Ministry of Defence. Picture David Harrison/ Yorkshire Air Museum. Legion d’Honneur medals presented to 21 Normandy Veterans at Yorkshire Air Museum on Sunday 22nd May, 2016. Pictured is Harry Ramsey of Horsforth, Leeds, who recieved the medal from Colonel Bruno Cunat, French Liasion Officer to the Ministry of Defence. Picture David Harrison/ Yorkshire Air Museum. Legion d’Honneur medals presented to 21 Normandy Veterans at Yorkshire Air Museum on Sunday 22nd May, 2016. Pictured is Ernest Naylor of Sunderland, who recieved the medal from Colonel Bruno Cunat, French Liasion Officer to the Ministry of Defence. Picture David Harrison/ Yorkshire Air Museum. Pictured in front of a Halifax Bomber. Legion d’Honneur medals presented to 21 Normandy Veterans at Yorkshire Air Museum on Sunday 22nd May, 2016. Pictured is George Edward Meredith of Acomb, York, who recieved the medal from Colonel Bruno Cunat, French Liasion Officer to the Ministry of Defence. Picture David Harrison/ Yorkshire Air Museum. Legion d’Honneur medals presented to 21 Normandy Veterans at Yorkshire Air Museum on Sunday 22nd May, 2016. Pictured is George Edward Meredith of Acomb, York, who recieved the medal from Colonel Bruno Cunat, French Liasion Officer to the Ministry of Defence. Picture David Harrison/ Yorkshire Air Museum. Presentation of the Legion d’Honneur ceremony held at the Yorkshire Air Museum, Elvington, on Sunday 22nd September, 2016. Pictured is Horace Hodgson. Picture David Harrison / Yorkshire Air Museum. Presentation of the Legion d’Honneur ceremony held at the Yorkshire Air Museum, Elvington, on Sunday 22nd September, 2016. Pictured John Graham with the Reverend Matthew Woodcock. Picture David Harrison / Yorkshire Air Museum. Presentation of the Legion d’Honneur ceremony held at the Yorkshire Air Museum, Elvington, on Sunday 22nd September, 2016. Pictured is Norman Berryman. Picture David Harrison / Yorkshire Air Museum. Presentation of the Legion d’Honneur ceremony held at the Yorkshire Air Museum, Elvington, on Sunday 22nd September, 2016. Pictured is Lord Mayor of York Councillor Sonja Crisp with John Graham. Picture David Harrison / Yorkshire Air Museum. Presentation of the Legion d’Honneur ceremony held at the Yorkshire Air Museum, Elvington, on Sunday 22nd September, 2016. Pictured George Edward Meredith with Colonel Bruno Cunat. Picture David Harrison / Yorkshire Air Museum. Presentation of the Legion d’Honneur ceremony held at the Yorkshire Air Museum, Elvington, on Sunday 22nd September, 2016. Pictured Ernest Naylor with Colonel Bruno Cunat. Picture David Harrison / Yorkshire Air Museum. Presentation of the Legion d’Honneur ceremony held at the Yorkshire Air Museum, Elvington, on Sunday 22nd September, 2016. Pictured Bernard John Richardson with Colonel Bruno Cunat. Picture David Harrison / Yorkshire Air Museum. Presentation of the Legion d’Honneur ceremony held at the Yorkshire Air Museum, Elvington, on Sunday 22nd September, 2016. Pictured Ken Smith with Colonel Bruno Cunat. Picture David Harrison / Yorkshire Air Museum. Presentation of the Legion d’Honneur ceremony held at the Yorkshire Air Museum, Elvington, on Sunday 22nd September, 2016. Picture David Harrison / Yorkshire Air Museum. Presentation of the Legion d’Honneur ceremony held at the Yorkshire Air Museum, Elvington, on Sunday 22nd September, 2016. Pictured Lord Mayor of York Councillor Sonja Crisp speaks. Picture David Harrison / Yorkshire Air Museum. Presentation of the Legion d’Honneur ceremony held at the Yorkshire Air Museum, Elvington, on Sunday 22nd September, 2016. Pictured are Bernard John Richardson, Willie Riley and Ken Smith having their photograph taken. Picture David Harrison / Yorkshire Air Museum. Presentation of the Legion d’Honneur ceremony held at the Yorkshire Air Museum, Elvington, on Sunday 22nd September, 2016. Pictured is Reginald Deighton. Picture David Harrison / Yorkshire Air Museum. Presentation of the Legion d’Honneur ceremony held at the Yorkshire Air Museum, Elvington, on Sunday 22nd September, 2016. Pictured Kenneth Cooke and Douglas Dawson. Picture David Harrison / Yorkshire Air Museum. back from left, Horace Hodgson, George Hubert Hollings, Kenneth Alfred Johnson, James Matthew Johnston, Robert Mathieson, Ernest Naylor, Harry Ramsey, Bernard John Richardson, Willie Riley and Kenneth William Smith, all who recieved the medal from Colonel Bruno Cunat, French Liasion Officer to the Ministry of Defence. Picture David Harrison/ Yorkshire Air Museum. Presentation of the Legion d’Honneur ceremony held at the Yorkshire Air Museum, Elvington, on Sunday 22nd September, 2016. Pictured is Kenneth Cooke. Picture David Harrison / Yorkshire Air Museum. 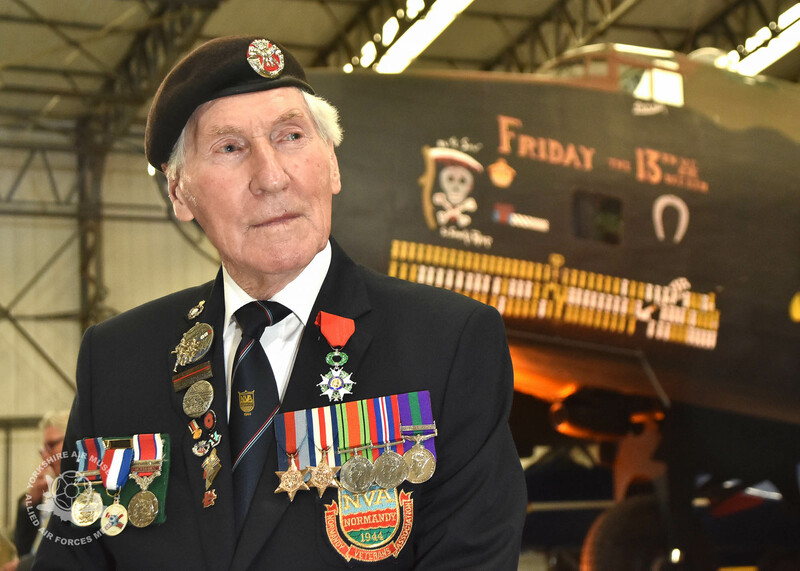 Presentation of the Legion d’Honneur ceremony held at the Yorkshire Air Museum, Elvington, on Sunday 22nd September, 2016. Pictured Douglas Dawson and Reginald Deighton. Picture David Harrison / Yorkshire Air Museum. Presentation of the Legion d’Honneur ceremony held at the Yorkshire Air Museum, Elvington, on Sunday 22nd September, 2016. Pictured are George Graham and John Graham. Picture David Harrison / Yorkshire Air Museum. Presentation of the Legion d’Honneur ceremony held at the Yorkshire Air Museum, Elvington, on Sunday 22nd September, 2016. Pictured James Joseph Healy. Picture David Harrison / Yorkshire Air Museum. Presentation of the Legion d’Honneur ceremony held at the Yorkshire Air Museum, Elvington, on Sunday 22nd September, 2016. Pictured waiting for the start. Picture David Harrison / Yorkshire Air Museum. Legion d’Honneur medals presented to 21 Normandy Veterans at Yorkshire Air Museum on Sunday 22nd May, 2016. Pictured front from left are, Albert Edward Barritt, Norman Berryman, Kenneth Charlton, Kenneth Cooke, Douglas Dawson, Reginald Deighton, George Grahm, Dennis James Haydock and James Joseph Healy, with back from left, Horace Hodgson, George Hubert Hollings, Kenneth Alfred Johnson, James Matthew Johnston, Robert Mathieson, Ernest Naylor, Harry Ramsey, Bernard John Richardson, Willie Riley and Kenneth William Smith, all who recieved the medal from Colonel Bruno Cunat, French Liasion Officer to the Ministry of Defence. Picture David Harrison/ Yorkshire Air Museum. Legion d’Honneur medals presented to 21 Normandy Veterans at Yorkshire Air Museum on Sunday 22nd May, 2016. Pictured is Robert Mathieson of Ricall, York, York, who recieved the medal from Colonel Bruno Cunat, French Liasion Officer to the Ministry of Defence. Picture David Harrison/ Yorkshire Air Museum. Legion d’Honneur medals presented to 21 Normandy Veterans at Yorkshire Air Museum on Sunday 22nd May, 2016. Pictured is James Matthew Johnston of Amble, Morpeth, who recieved the medal from Colonel Bruno Cunat, French Liasion Officer to the Ministry of Defence. Picture David Harrison/ Yorkshire Air Museum. (Corporal 22 Independant Pathfinder Company dropped in advance of main body of 6th Airbourne Division during night of 5-6th June 44 at Ranville). Legion d’Honneur medals presented to 21 Normandy Veterans at Yorkshire Air Museum on Sunday 22nd May, 2016. Pictured is Kenneth Alfred Johnson of Balby, Doncaster, who recieved the medal from Colonel Bruno Cunat, French Liasion Officer to the Ministry of Defence. Picture David Harrison/ Yorkshire Air Museum. Legion d’Honneur medals presented to 21 Normandy Veterans at Yorkshire Air Museum on Sunday 22nd May, 2016. Pictured is George Hubert Hollings of Roundhay, Leeds, who recieved the medal from Colonel Bruno Cunat, French Liasion Officer to the Ministry of Defence. Picture David Harrison/ Yorkshire Air Museum. Pictured in front of a Dakota transport aircraft like the one in which he was evacuated from France after being wounded is Horace Hodgson. Legion d’Honneur medals presented to 21 Normandy Veterans at Yorkshire Air Museum on Sunday 22nd May, 2016. Pictured is Horace Hodgson of manor Mount, Leeds, who recieved the medal from Colonel Bruno Cunat, French Liasion Officer to the Ministry of Defence. Picture David Harrison/ Yorkshire Air Museum. Legion d’Honneur medals presented to 21 Normandy Veterans at Yorkshire Air Museum on Sunday 22nd May, 2016. Pictured is Horace Hodgson of manor Mount, Leeds, who recieved the medal from Colonel Bruno Cunat, French Liasion Officer to the Ministry of Defence. Picture David Harrison/ Yorkshire Air Museum. Legion d’Honneur medals presented to 21 Normandy Veterans at Yorkshire Air Museum on Sunday 22nd May, 2016. Pictured is Dennis James Joseph Healey of Middleton, Manchester, who recieved the medal from Colonel Bruno Cunat, French Liasion Officer to the Ministry of Defence. Picture David Harrison/ Yorkshire Air Museum. Legion d’Honneur medals presented to 21 Normandy Veterans at Yorkshire Air Museum on Sunday 22nd May, 2016. Pictured is Dennis James Haydock of Strensall, York, who recieved the medal from Colonel Bruno Cunat, French Liasion Officer to the Ministry of Defence. Picture David Harrison/ Yorkshire Air Museum. Legion d’Honneur medals presented to 21 Normandy Veterans at Yorkshire Air Museum on Sunday 22nd May, 2016. Pictured is John Graham of York, who recieved the medal from Colonel Bruno Cunat, French Liasion Officer to the Ministry of Defence. Picture David Harrison/ Yorkshire Air Museum. Legion d’Honneur medals presented to 21 Normandy Veterans at Yorkshire Air Museum on Sunday 22nd May, 2016. Pictured is George Graham of Weatherby, who recieved the medal from Colonel Bruno Cunat, French Liasion Officer to the Ministry of Defence. Picture David Harrison/ Yorkshire Air Museum. Legion d’Honneur medals presented to 21 Normandy Veterans at Yorkshire Air Museum on Sunday 22nd May, 2016. Pictured is Reginald Deighton of Acomb, York, who recieved the medal from Colonel Bruno Cunat, French Liasion Officer to the Ministry of Defence. Picture David Harrison/ Yorkshire Air Museum. Pictured before the presentations. Legion d’Honneur medals presented to 21 Normandy Veterans at Yorkshire Air Museum on Sunday 22nd May, 2016. Pictured is Douglas Dawson of Throckley, Newcstle-upon-Tyne who recieved the medal from Colonel Bruno Cunat, French Liasion Officer to the Ministry of Defence. Picture David Harrison/ Yorkshire Air Museum. Legion d’Honneur medals presented to 21 Normandy Veterans at Yorkshire Air Museum on Sunday 22nd May, 2016. Pictured is Douglas Dawson of Throckley, Newcstle-upon-Tyne who recieved the medal from Colonel Bruno Cunat, French Liasion Officer to the Ministry of Defence. Picture David Harrison/ Yorkshire Air Museum. Legion d’Honneur medals presented to 21 Normandy Veterans at Yorkshire Air Museum on Sunday 22nd May, 2016. Pictured is Kenneth Cooke of York, Private 7th Battalion The Green Howards (Normandy from 6th June 44, Gold Beach until July 14th when wounded) who recieved the medal from Colonel Bruno Cunat, French Liasion Officer to the Ministry of Defence. Picture David Harrison/ Yorkshire Air Museum. Legion d’Honneur medals presented to 21 Normandy Veterans at Yorkshire Air Museum on Sunday 22nd May, 2016. Pictured is Kenneth R Charlton of Laceby, Lincolnshire, Gunner Royal Artillery, Radio Operator, 86 Anti-Tank Regiment RA who recieved the medal from Colonel Bruno Cunat, French Liasion Officer to the Ministry of Defence. Picture David Harrison/ Yorkshire Air Museum. Legion d’Honneur medals presented to 21 Normandy Veterans at Yorkshire Air Museum on Sunday 22nd May, 2016. Pictured is Kenneth R Charlton of Laceby, Lincolnshire, pictured before the presentations, Gunner Royal Artillery, Radio Operator, 86 Anti-Tank Regiment RA who recieved the medal from Colonel Bruno Cunat, French Liasion Officer to the Ministry of Defence. Picture David Harrison/ Yorkshire Air Museum. Legion d’Honneur medals presented to 21 Normandy Veterans at Yorkshire Air Museum on Sunday 22nd May, 2016. Pictured is Kenneth R Charlton of Laceby, Lincolnshire, Gunner Royal Artillery, Radio Operator, 86 Anti-Tank RegimentRA who recieved the medal from Colonel Bruno Cunat, French Liasion Officer to the Ministry of Defence. Picture David Harrison/ Yorkshire Air Museum. Legion d’Honneur medals presented to 21 Normandy Veterans at Yorkshire Air Museum on Sunday 22nd May, 2016. Pictured is Norman Berryman of Heworth, York, Warrant Officer, RAF, who recieved the medal from Colonel Bruno Cunat, French Liasion Officer to the Ministry of Defence. Picture David Harrison/ Yorkshire Air Museum. Legion d’Honneur medals presented to 21 Normandy Veterans at Yorkshire Air Museum on Sunday 22nd May, 2016. Pictured is Albert Edward Barritt of Acomb, York, who recieved the medal from Colonel Bruno Cunat, French Liasion Officer to the Ministry of Defence. Picture David Harrison/ Yorkshire Air Museum.